Forty years after the fact, Ken Jacobs is at it again. Revisiting the 1905 Biograph one-reeler that he dissected in his 1969 classic Tom, Tom the Piper’s Son, the filmmaker subjects the material to a fresh round of deconstruction, this time enlisting the technology of 3D processing to tease a fresh set of possibilities from a text that’s already been given an exhaustive working over. 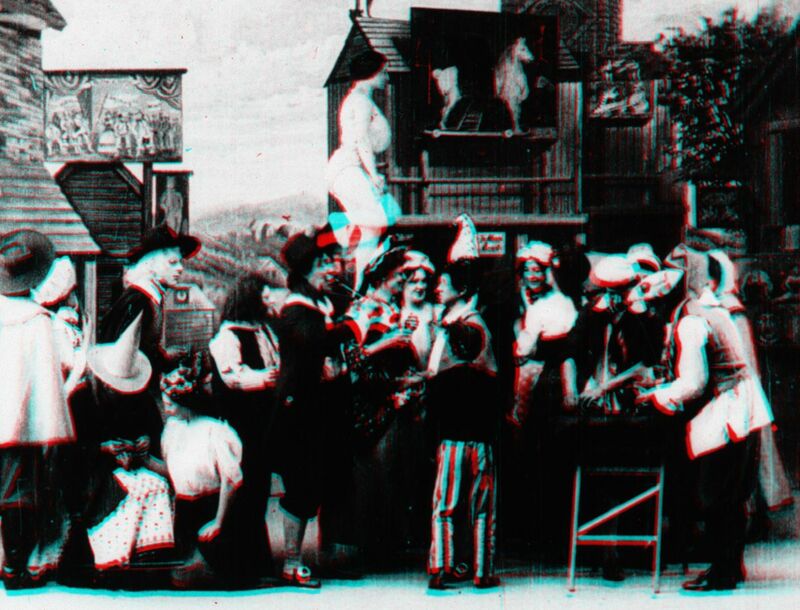 A diptych, Anaglyph Tom (Tom with Puffy Cheeks) treats two different sections of the original short with two sets of manipulative strategies. In the first section, Jacobs works with a rowdy, screen-filling tableau in which a group of assorted harlequins, circus performers, and villagers gather in a town square for a frolic. An essentially non-narrative sequence, the action consists principally of performance, a woman tossing hoops in the air while seeming to levitate, a clown juggling, a man turning flips. Stretching roughly two minutes of footage into about 50 minutes of screen time, Jacobs discharges every weapon in his digital arsenal, obsessively poring over each inch of the film stock. 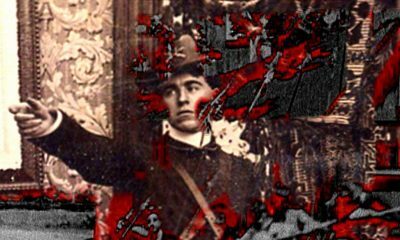 Adding flicker effects, removing sections of the screen image and bringing them forward (literally, given the 3D effect) for closer inspection, rewinding and replaying chunks of the action, zooming in on a seemingly minor element, Jacobs makes a case for the possibilities of digital technology to uncover previously unglimpsed details and achieve belated discoveries in a century-old text. But the filmmaker also understands the odd juxtapositions inherent in such a project and this first section is rife with unsettling moments, achieved principally through the recontextualization of the original images. Among those images made strange through Jacobs’s manipulations: close-ups of isolated faces, never intended to be anything but one of countless details in a cluttered tableau, looking in their unexpected spotlight very much like skulls, and cutouts of black-and-white figures set against bright, single-color backgrounds. In these instances, the elements of the original text take on a sepulchral quality, the antiquated images seeming positively dead when isolated by the pitiless modernity of Jacobs’s digital tool kit. If the segment of the original short treated in the film’s first act downplays plot progression in favor of a single non-narrative tableau, then the second half of Jacobs’s film focuses on material far more concerned with advancing the story. The difficulty for a contemporary audience in following the action of the earlier sequence (a cluttered tableau in which there are few signals to direct the viewer’s attention may be typical of early-20th-century filmmaking, but it’s more or less foreign to modern sensibilities) dictated the filmmaker’s obsessively deconstructionist approach to that material, highlighting specific details or replaying sequences with varying focal points in order to suggest to the viewer different ways of approaching the text. But in the second section, the Biograph film’s plot-based material—the narrative concerns the efforts of a group of townspeople to catch a pig thief—leads Jacobs to adopt a leaner, more straightforward approach to his textual manipulations. Applying a flicker effect to the original negative, the filmmaker slows down the material, stretching a few quick sequences out into a half-hour of screen time. As the simple actions of the film’s characters unwind at a frustratingly languid pace, Jacobs distances the viewer from the story, allowing him to study the exact staging of the sequences while undermining the primacy of the narrative by slowing down the action to the point where it can only be followed analytically. After that, the only thing left is to move into a more or less complete abstraction, and Jacobs brings his film to a close by morphing the one-reeler’s imagery first into a lovely color-added series of kaleidoscopic designs and then into completely illegible chunks of gray, ending the project with a final reductio ad absurdum of the original text. Although Jacobs has written that the “real subject” of Anaglyph Tom is “depth-perception itself,” it’s clear that the filmmaker has a few other things on his mind as well. If the implicit political context of Jacobs’s 2007 feature Razzle Dazzle—like the present film, a digital deconstruction of an early-20th-century short—was the occupation of Iraq, then the explicit context of Anaglyph Tom is the current economic crisis and the years of unregulated free-market activity that made it possible. But the film’s political concerns are less well integrated into the project than in the earlier work and we’re left to conjecture as to just how the film’s three instances of topical allusion—a shot of a newspaper headline, footage of Alan Greenspan testifying before the Senate oversight committee, and barely audible sound bites playing over the final abstract imagery—fit in with the film’s more central concerns. While we know that the Biograph short was produced under a specific set of unregulated economic circumstances in which production companies were allowed a vertical monopoly of production and distribution, and we can speculate as to the circumstances that allowed for the development of the digital technology that Jacobs relies on throughout the project, it’s left to our imagination to fill in the rest of a tenuous connection with the current economic climate. All of which is to say that Jacobs’s feature is far more successful as an inquiry into the nature of the film medium than as a political statement, but given his intensive 40-year engagement with his source material, what else did we expect anyway?